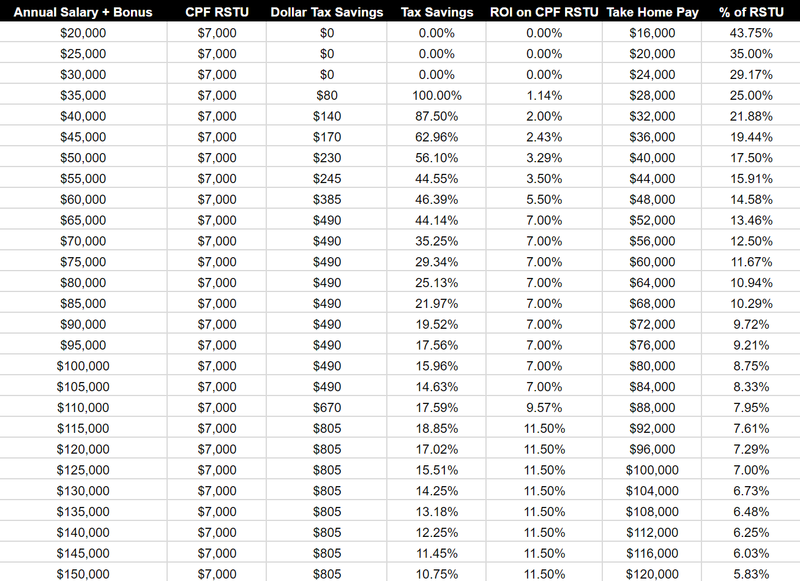 CPF RSTU - Is It Worth It? We are close to the end of the 2017 year and have worked for almost another year. In a few months time, we will be thanked "for our contribution towards nation building". lol. I am referring to the income tax. 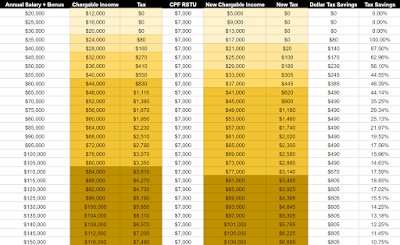 I have been thinking if I should be doing a CPF RSTU (Retirement Sum Top Up) to lower my tax. 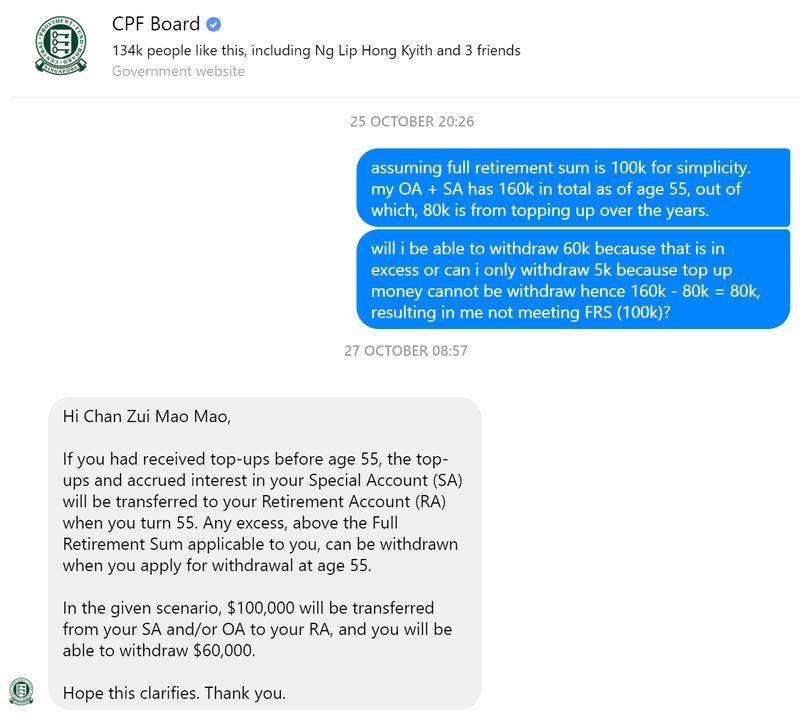 It is interesting to see how the facebook finance communities (Seedly Personal Finance Community (SG) and BIGS World - Build Wealth, Live a Good Life) advocates topping up of CPF as compared to my random conversations with my colleagues who almost all showed disgust towards doing it. My colleagues would look at it as though I am crazy and say something along the line of "topping up of CPF is one-way direction, you will never get it out". I would not argue with that statement because it is true to a certain extent. 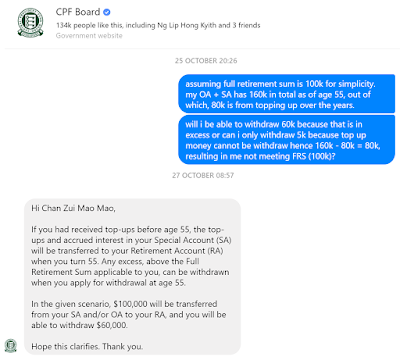 I double confirm with CPF Board via Facebook messenger and gave them a hypothetical question to ensure that my understanding is correct. 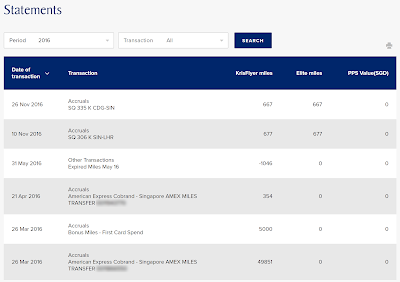 As you can see, one will be able to withdraw any amount in excess of FRS (Full Retirement Sum). Based on my FRS forecast, it will probably be around $300,000 when we are 55 years old (28 years later) assuming the FRS continues to increase at a 2-3% rate. I am pretty confident I will be able to exceed FRS if I continue to work and the policy does not change again. lol. 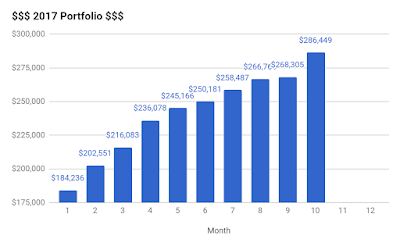 My previous article on CPF Milestone ($40k in Special Account) and The Power of Compound Interest assumes that even if I stop working now and do nothing, the SA would have grown to $141,000. As usual, KPO starts punching various numbers into Google Spreadsheet... The numbers generated are based on KPO's profile who has an earned income $1,000 relief and an NSman $3,000 relief which is group under "Other Reliefs". You can download the spreadsheet and modify the numbers to fit your profile. 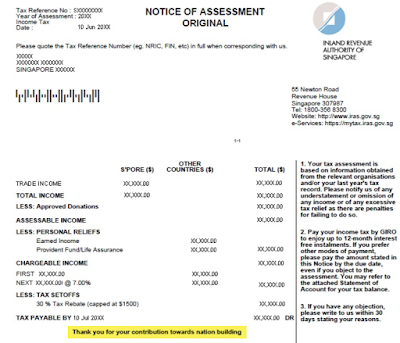 The taxable/chargeable income is calculated by deducting the 20% CPF employee contribution and other reliefs against the total annual salary + bonus. The income tax rate would differ accordingly based on the taxable/chargeable income. You can refer to IRAS income tax rates for more information. 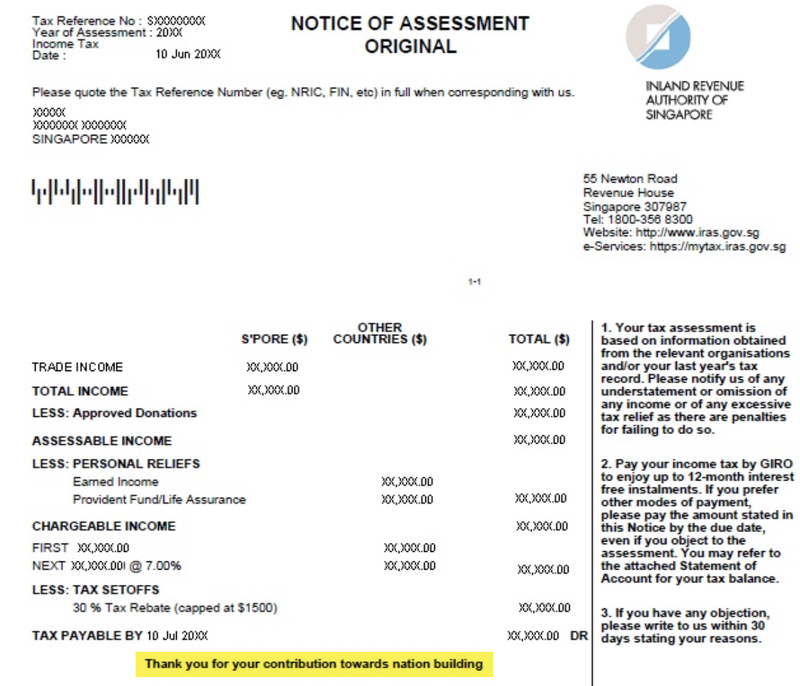 A $7,000 CPF RSTU would lower the taxable/chargeable income. When the stars are aligned, one can even have a 100% tax savings! lol. 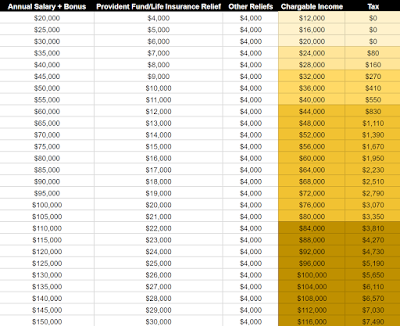 Having said that, it is definitely not feasible when we look at the below table. 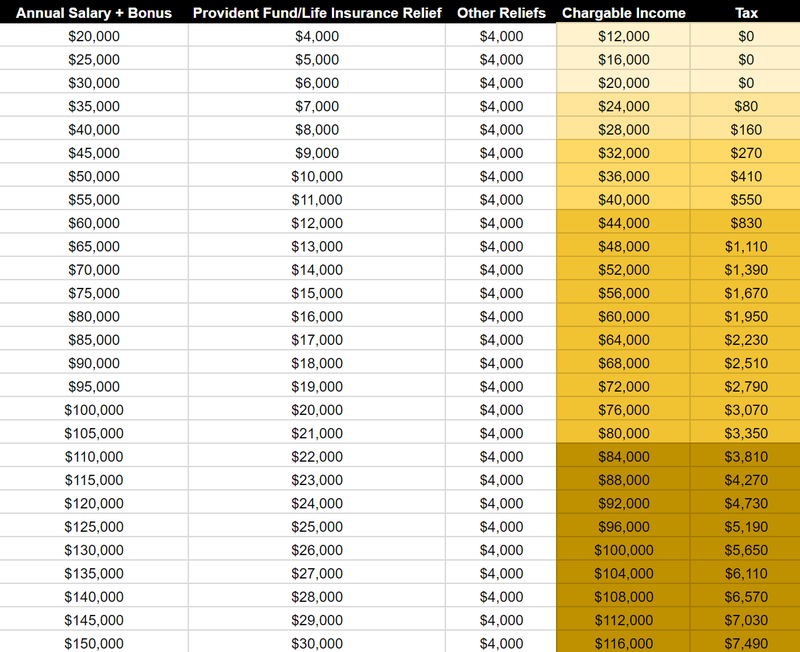 The amount $7,000 is relative to one person income. To enjoy that $80/100% tax savings, he would have to contribute 25% of his take home pay. Besides looking at it from a tax saving point of view, one can also look at it from an investment point of view. The dollar tax savings can be treated as a return on investment/dividend. The reason is that I would probably use the $7,000 to buy stock and continue to grow our portfolio. From an investment point of view, the ROI would be equivalent to your income tax rate (most of the time except when you suddenly belongs to a lower tax bracket). On top of that, there is also a guaranteed 4% capital growth (SA interest) year on year. Hence, your guaranteed return for the first year would be your tax rate + 4% interest. 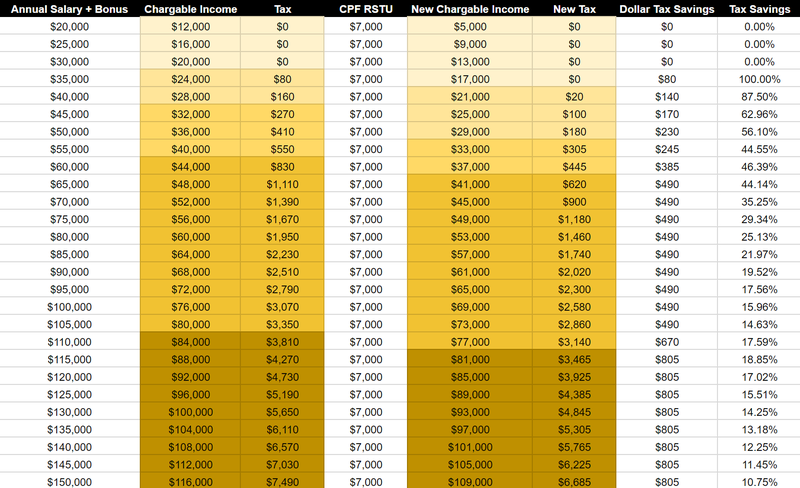 The higher your income tax, the higher the return, the lesser it affects your cash flow (take home pay) which is limited to the CPF Annual Limit of $37,740. 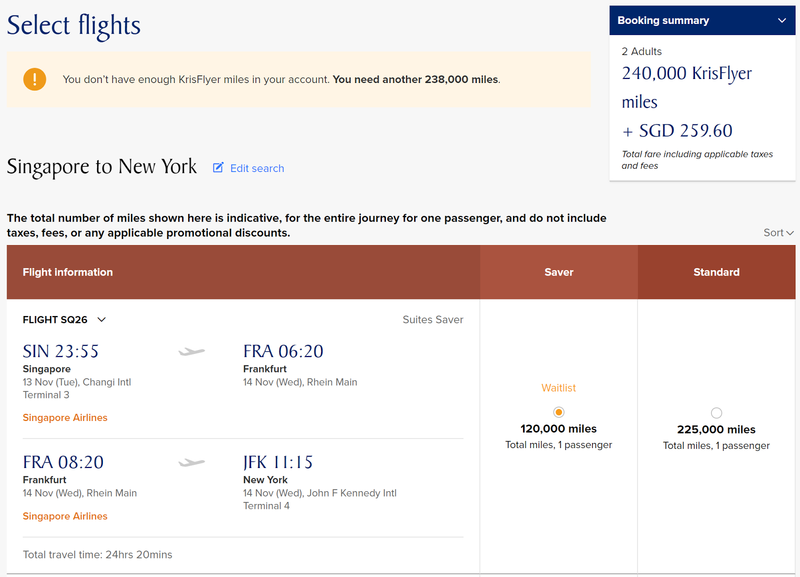 To be honest, I have no idea where/how one can find such a high return, risk-free investment elsewhere. The market return may be higher but it is definitely not guaranteed. 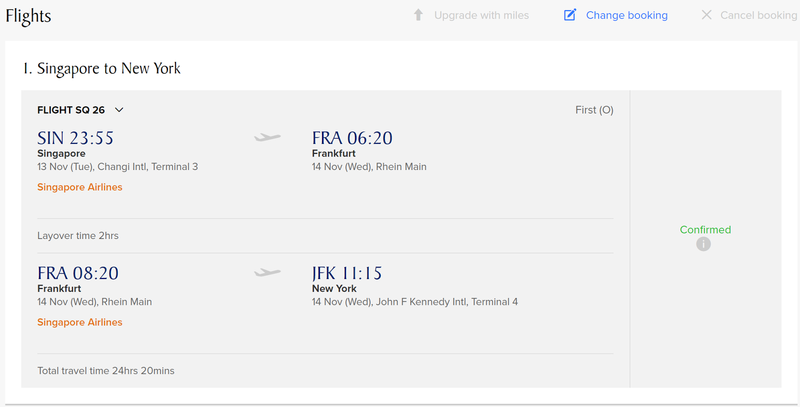 With this numbers, I am pretty sure what I will be doing. So is it worth it? It depends. Hahahaha. If someone says it is good, it doesn't necessarily mean that it is good for you, you got to make the decision yourself. You can download a copy of the spreadsheet here - CPF RSTU. 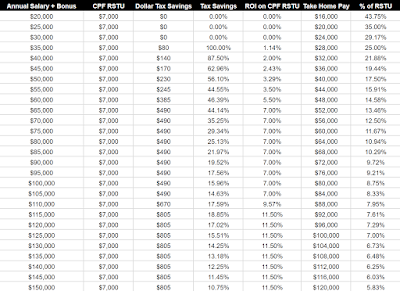 Have fun with the spreadsheet and I hope it helps in your tax planning/investment! KPO is sharing more spreadsheet! Hahahaha. We have a few IPO upcoming and the latest one is RE&S Holdings Limited (closes on tomorrow/19th November 12pm) followed closely by MindChamps (closes on 22 November 12pm). 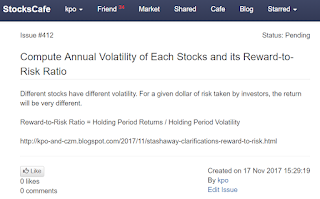 I did a 3 years analysis a few months back on IPOs - Will IPO Make Money - IPO Analysis for the Last 3 Years. Do take a look if you have not :) I jokingly concluded that we should participate in all the IPOs and sell on its opening day! While I was reading Mr. IPO's summary on RE&S Holdings, he mentioned that this IPO will be a hit and run and I thought of coming up with this spreadsheet. A quick way to tell if a company is trading at fair value is to compare its PE against that of its peers. In the above analysis, we can be sure that RE&S Holdings is trading below the industry average PE. Do note PE comparison is a quick way to compare stocks, not the best way. Is there even a best way? lol. 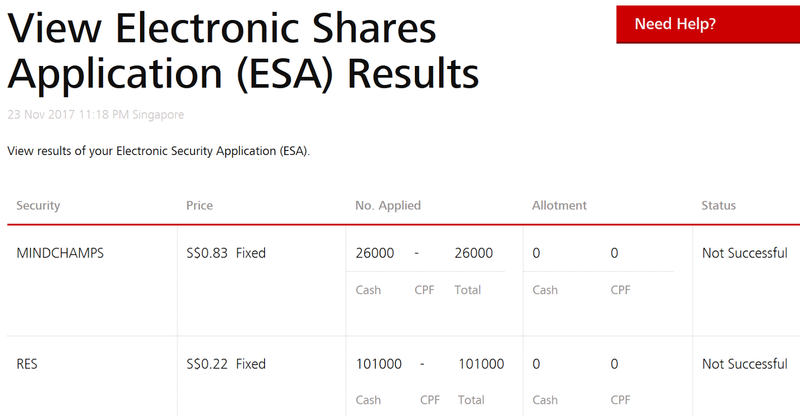 Using RE&S Holdings as an example, the following highlighted fields can be modified/configured with the relevant numbers. Based on the budget/cash you have, it will automatically compute the number of units that can be applied. One can apply for IPO either through the public tranche (ATM or ibanking) with a $2 application fee or through placement where the brokerage fee is at 1% with 7% GST. Assuming that we were allocated X number of units and we sell the stock at around industry PE which is $0.255. Regardless of the number of units allocated, we will definitely profit from it including all the fees! However, if we were to sell the stock slightly higher than IPO price at $0.225, depending on the number of units allocated, we may/may not lose money after deducting the initial cost and the commission from selling the stock. This spreadsheet will also be helpful in determining a trailing stop loss for your IPO stock. 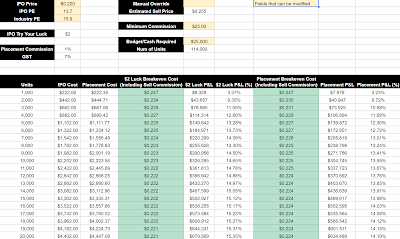 Google spreadsheet can be accessed here - IPO Hit and Run Calculator. Have fun! On a side note, we will be applying for 101,000 units of RE&S Holdings Limited. Huat ah! 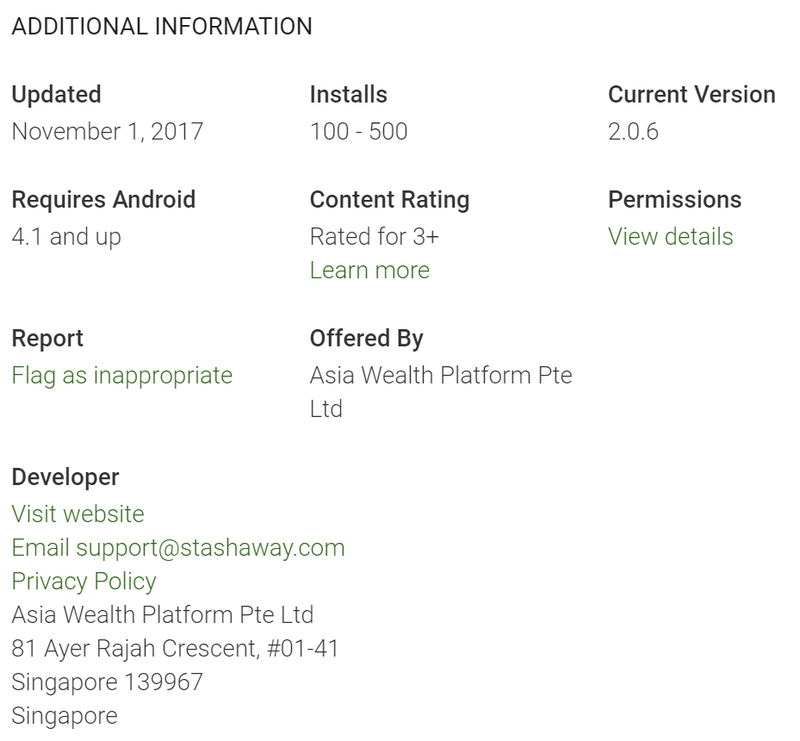 I received an email titled as above from Freddy Lim (Co-Founder & Chief Investment Officer of StashAway) a few days ago regarding my previous blog post - StashAway - October 2017. 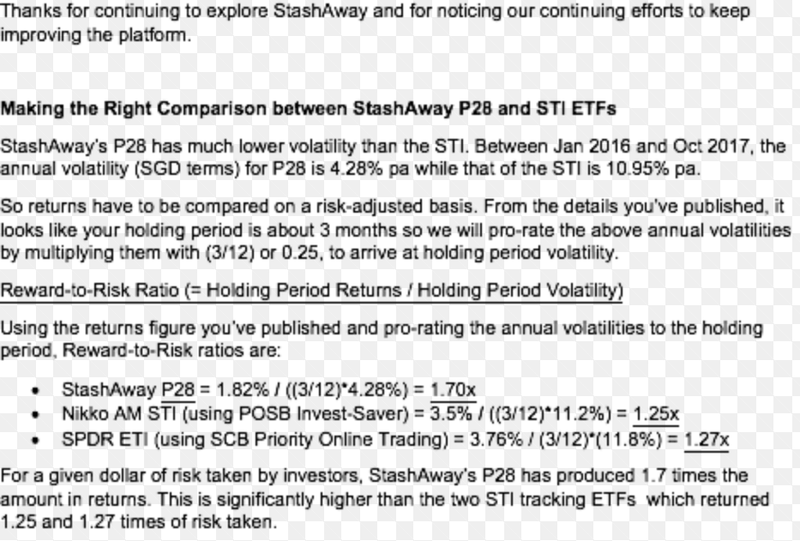 In the monthly update, there is a section "StashAway VS STI ETF" where I attempt to track and compare the performance of our StashAway investment with that of either STI ETF through different platforms. The rationale is that I have no way to compare the performance of the different robo-advisors but I can certainly compare it with both the STI ETF. The difference in performance would be the opportunity cost one would be experiencing for choosing any of the 3 investment options. Freddy states that a better comparison is to include risk/volatility of the asset using Reward-to-Risk Ratio. 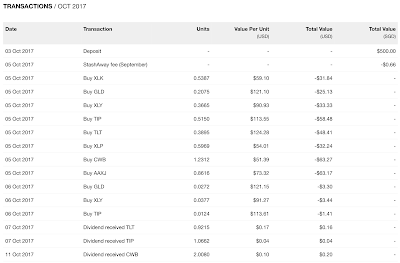 In his calculations, he provided the annual volatility for each asset, pro-rated them based on the holding period to arrive at the Holding Period Volatility and divided the returns I have computed (Holding Period Returns) with his figures. Unfortunately, KPO is not rich enough to subscribe to Bloomberg to get such information and his Maths is not good. Fortunately, I am a Friend of StocksCafe, so I shall try my luck by submitting a new feature request to Ph.D. Evan. Hahahaha. 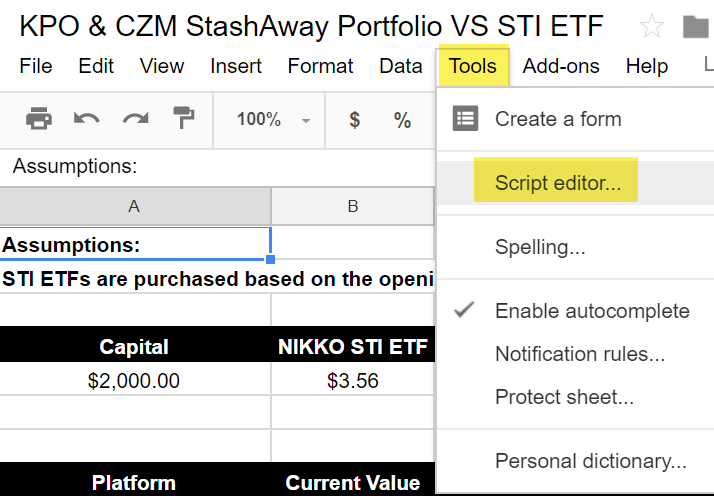 Meanwhile, I have updated the spreadsheet - KPO & CZM StashAway Portfolio VS STI ETF to include the Reward-to-Risk Ratio using the above values provided by Freddy. 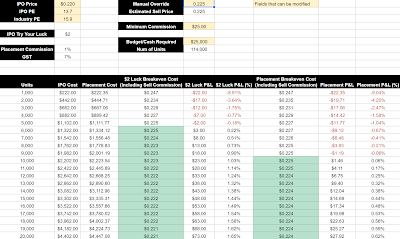 I would like to emphasize that the returns computed in the spreadsheet are too short (3 months) to be meaningful. I would say the same even 1 year later. 10 years later would be ideal but who knows if I will still be blogging then. lol. We know that in theory asset diversification will provide a higher return in the long run. Even a simple, 60% stocks 40% bonds would beat a 100% stocks allocation in the long run. The question is how long is considered long? We also know that high risk gives a higher return and vice versa but can we have the best of both worlds (minimum risk and maximum return)? This is what I hope StashAway will be able to help us achieve. 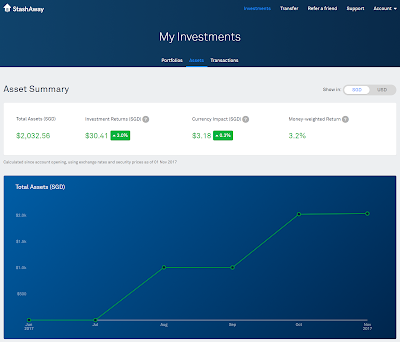 At the end of the day, I am doing this for 2 reasons - out of interest/hobby to track and see our investment grows and to report to my boss (CZM) since I am the one that persuaded her to invest our mutual fund (KPO Investment Fund) into StashAway. October has been an excellent month for stocks, high gets higher! 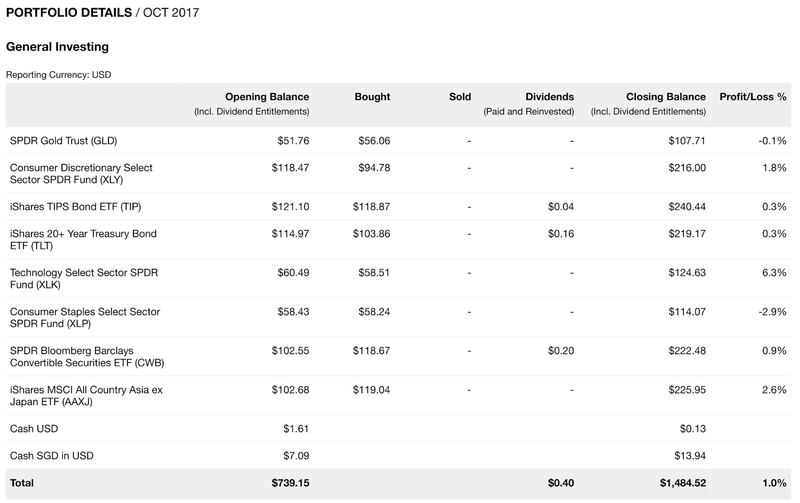 Our portfolio benefited from it - Portfolio Update - October 2017. StashAway is no different, we had a much better return compared to the previous month - StashAway - September 2017. 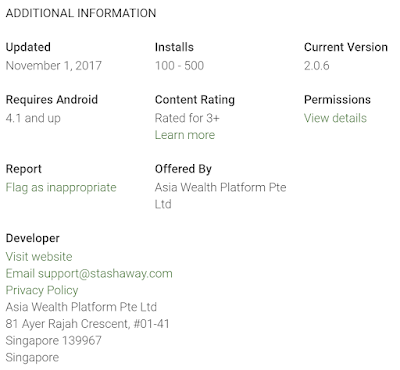 One thing to note is that StashAway has changed their web interface and introduced mobile application - StashAway Just Got Better! (Mobile App + New Interface. The change can also be seen on the monthly statement. 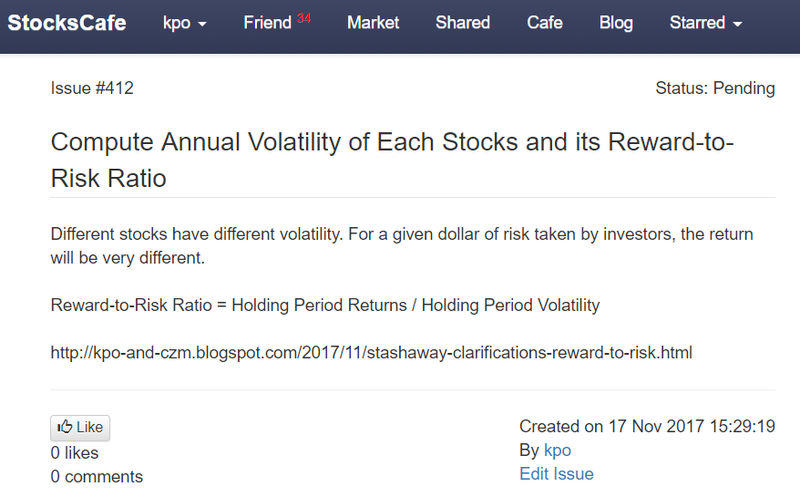 Returns have been broken down into "Portfolio Returns" and "Currency Impact". Exchange Rates are captured for both "Opening Balance" and "Closing Balance" giving investors much more visibility into their money/investment. Our capital is $2,000 so there is a $20.14 gain. 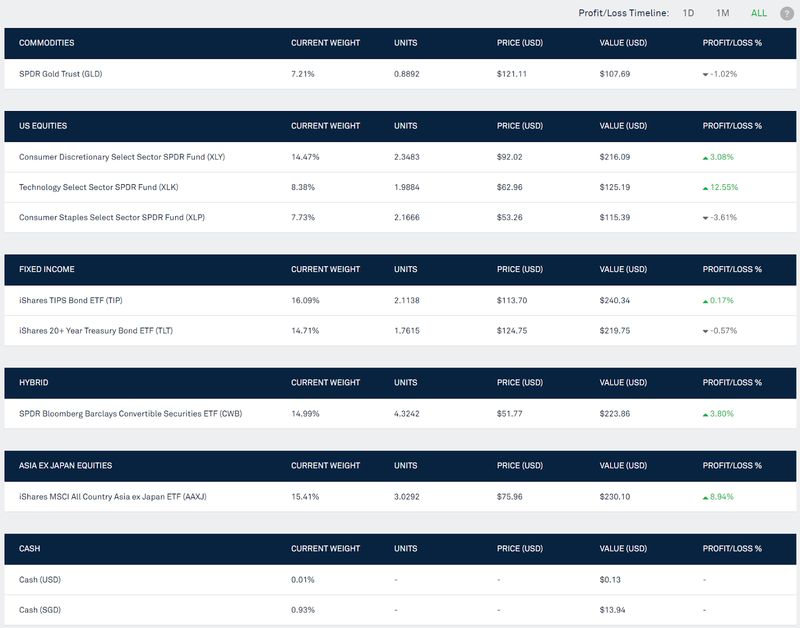 We can finally see the P&L for the underlying ETFs! 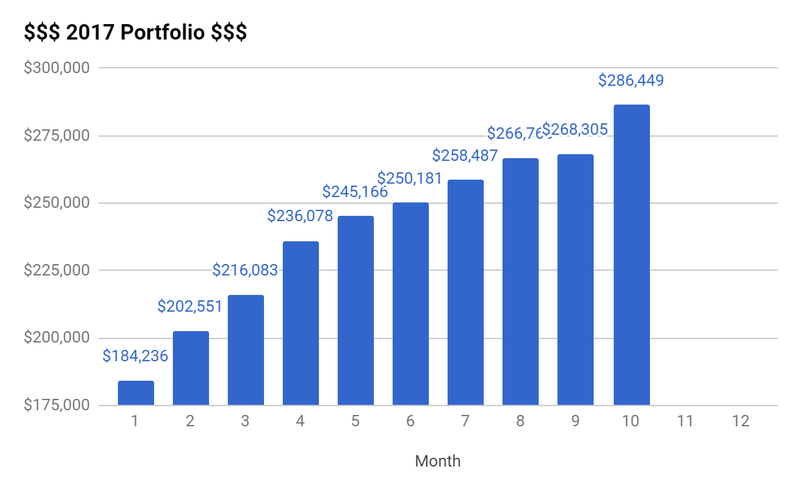 I recommended/referred a friend to invest and will be enjoying fee waiver for the next 6 months :) Technically, it is only $10,000 managed for free but I do not foresee us reaching/exceeding that in the next 6 months. In my opinion, these are all welcome changes and a testament to StashAway's commitment in providing the best platform by listening to feedback from their users/bloggers - A Coffee Session with Michele Ferrario - CEO of StashAway and Finance Smiths: StashAway Open Discussion. We were invited too but decided not to attend. We might attend if it is a masquerade ball. lol. 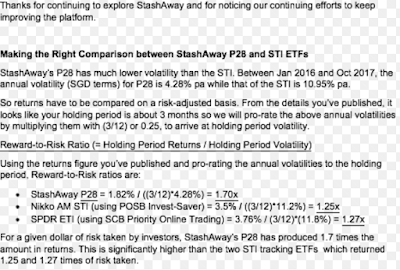 This month commentary: Interestingly, both STI ETFs are generating a much higher return than StashAway after fees. 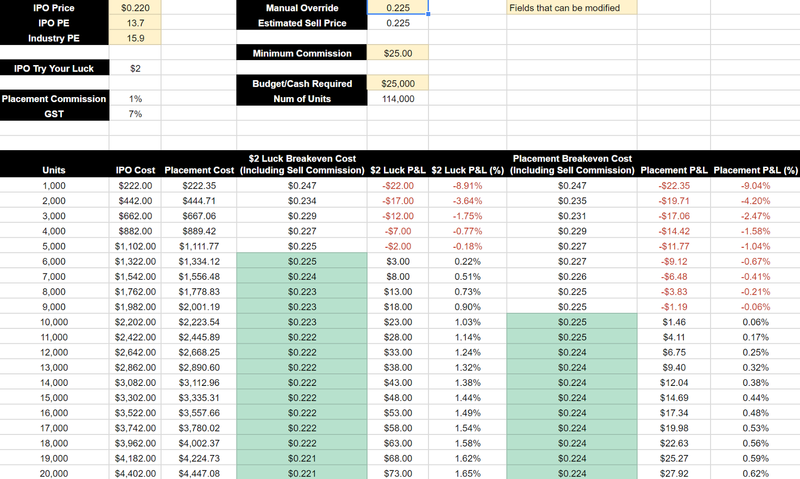 Although our StashAway account will not be incurring any fees till next year April, I will continue to add fees (estimated by taking the monthly-averaged assets x 0.8%/12 months) to the spreadsheet for better comparison. It is worth noting that the fees incurred by StashAway will probably exceed that of SCB Priority Online Trading soon. Bye Yahoo Finance! Hi Alpha Vantage! 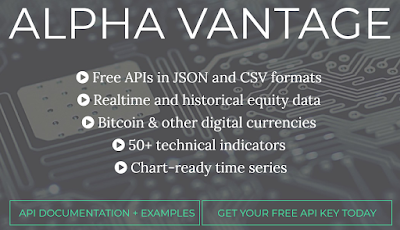 Yahoo Finance decided to discontinued their API services last week and cause a lot of spreadsheets and Excel around the world to break including mine. lol. SGX data is very expensive hence Google Finance does not provide it and others charge a fee for it. Stocks.cafe (formerly SGX cafe) is paying thousands for the licensing fee - The True Cost of Being Free. 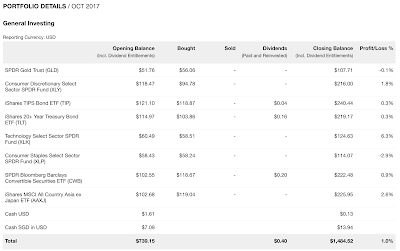 Kyith from Investment Moats was kind enough to come out with a workaround by pulling all the SGX stock price from his own site/server - Yahoo Finance Data Shuts Down – My Modification to My Stock Portfolio Tracker. However, that is slightly overkilled (loading 1022 stocks) if I am only interested in a few stocks' price. 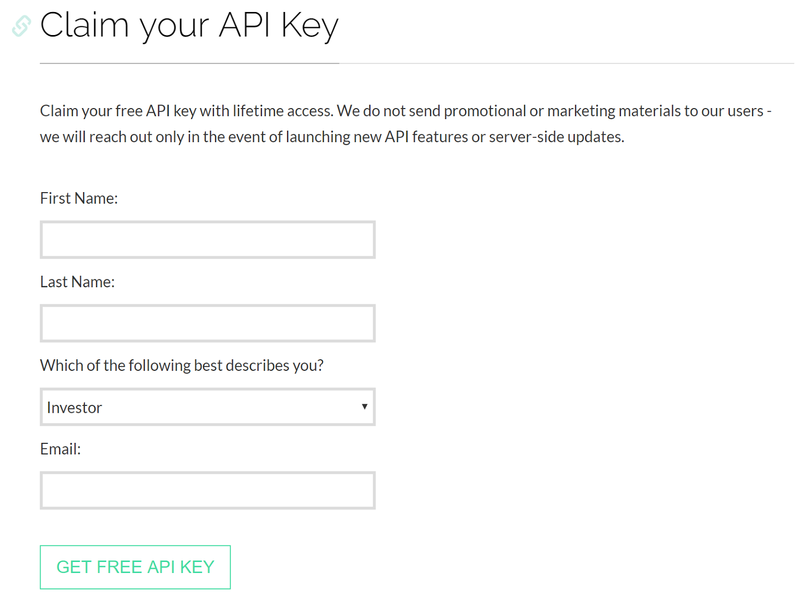 Go and Claim your API Key by filling up a simple form. Only first name, last name and email are required. 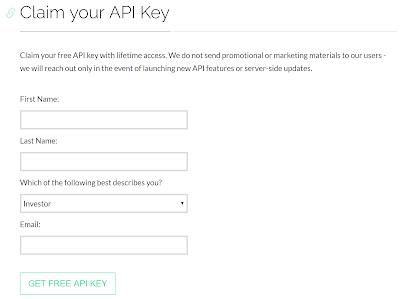 After you have submitted, copy down the provided API key somewhere immediately! They do not send any email and you cannot login to look for it again. Open up the relevant Google spreadsheet, go to "Tools" and click on "Script editor". Next, copy and paste the below code snippet into the newly opened up window/tab. You can name the project whatever you want and leave the script name as it is. It should look something like below. Once you are done, save the project. Some of you may have encountered a weird bug (getting a 0 instead of the latest price) which I believe is due to Alpha Vantage dropping the requests. I have added a sleep function so that it will not make all the requests at once. On the bright side, the longest it should take is 30 seconds due to limitation from Google Script side (all custom function will fail if it sleeps for longer than 30 seconds). 3. Call the Function and Get your Price! Simply call the function to get the latest price! Do note that the stock code format is similar to Yahoo Finance - "ABC.SI". 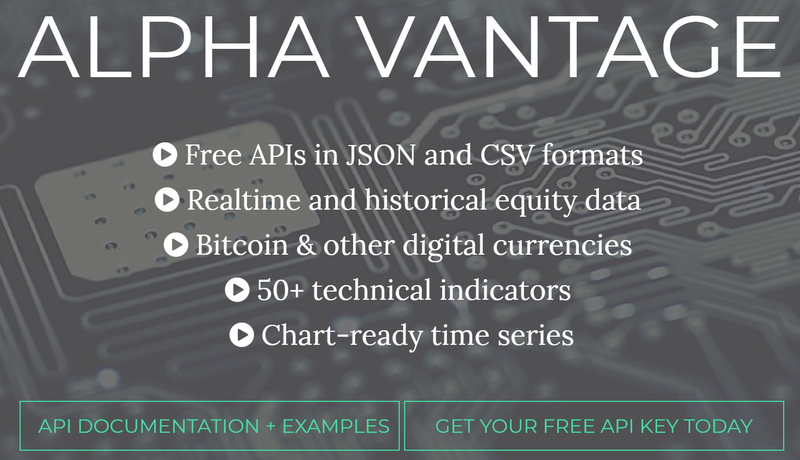 If you are more technical and can write your own code, Alpha Vantage provides other data as well, do refer to their API documentation for more information. Credits: The above code was found in one of investment moat's comments shared by chris. 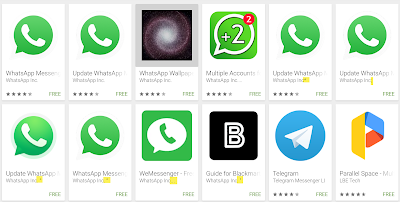 A few days ago, I was shopping in Google Play Store and I happened to come across the StashAway mobile application. I went on to check the developer information to confirm that it is a legitimate application. 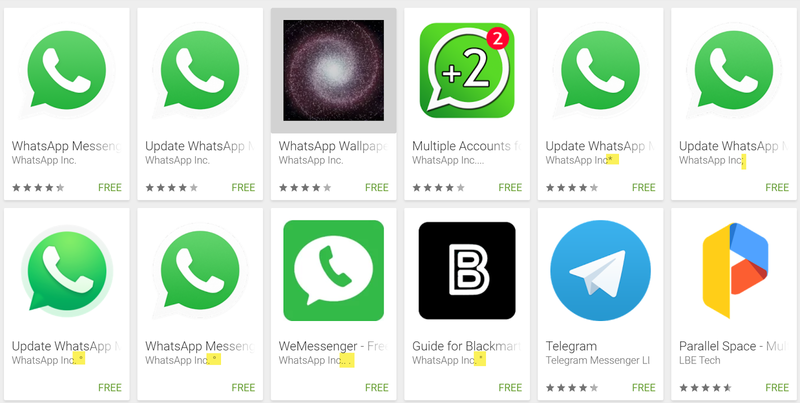 For example, there are many fake WhatsApp applications out there, so be careful! Given the necessary permissions, these applications can actually spy/steal information from you. Read your files, messages, contacts, etc. My bad, I digress... So I immediately downloaded the application and set it up. During the setup, you will be prompted to authenticate using fingerprint or PIN going forward. You might notice that the interface is slightly different but everything that is accessible from the web interface can be accessed from the mobile application which is great! Not sure why StashAway did not broadcast/market their mobile application yet. 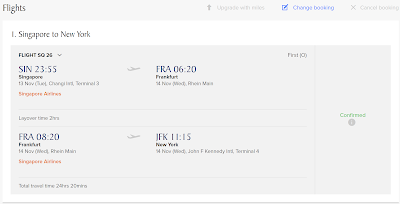 I was surprised to see a change in its web interface on 1st November after launching their mobile application! It is finally providing more information to the end user although I feel that there is still room for improvement. Nothing much has changed over here. 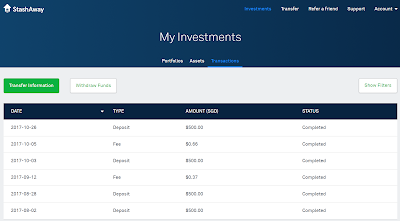 CZM and I only set up 1 portfolio using our a portion of our KPO Fund. Do note that the above returns exclude fees (one has to click on the question mark and read the information to be aware) which I felt was slightly misleading. 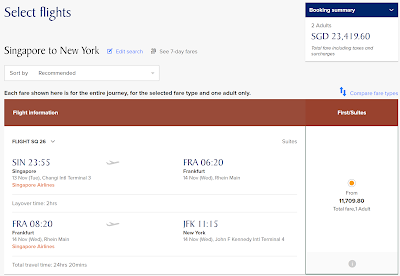 The previous interface showed a single return after fees. It also shows the Money-weighted Return/Internal Rate of Return (IRR) which is your total return after deducting the fees. 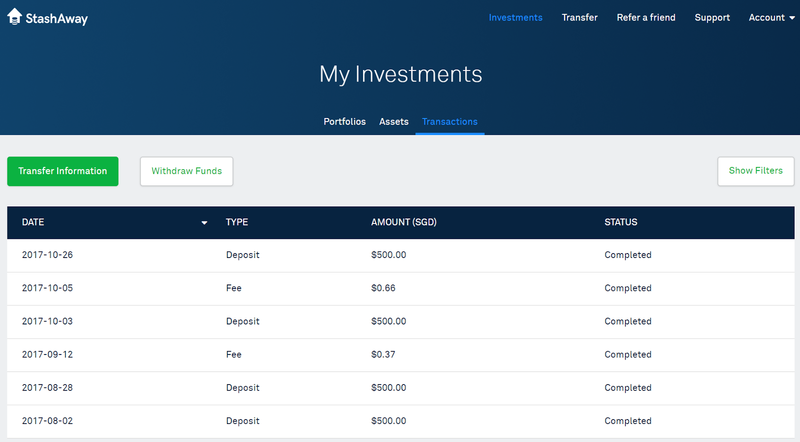 The new interface now allows one to change portfolio easily with a drop-down of all your portfolios. This is my favorite change! One can now see the P&L of individual ETFs across 3 time periods (1 day, 1 month or all time) which gives one the visibility into which ETFs is making/losing money. 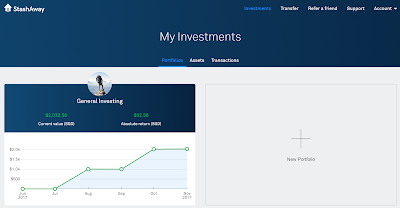 This was one of our biggest complaint that there is insufficient transparency when the investor cannot even see the P&L of his underlying investments. The dividends are still not visible to investors as of this moment. 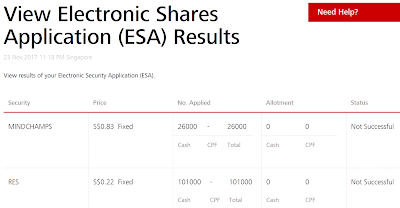 It will briefly appear as an additional row(s) under "Dividends" when a particular ETF is paying a dividend and once it is paid, it goes to the "Cash (USD)" component and the "Dividends" row(s) disappear into thin air. You will see it being paid in the monthly statement and that is about it, you would then lose that information/visibility forever. 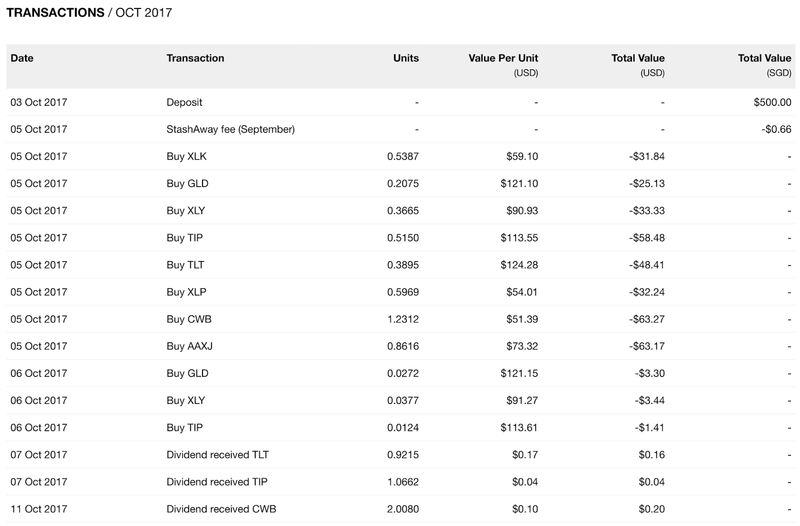 In my opinion, dividends contribute to the overall P&L of the ETF and should be shown in a separate column. Nothing change in this tab. 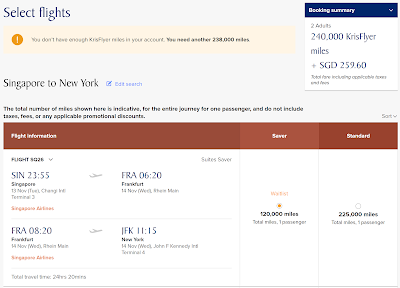 I was hoping the exchange rate during the conversion of SGD to USD would be captured somewhere, ideally here but guess not. There is a lot of activities this month! Saizen REIT was one of our first investment in REIT and we have been holding on to it for about 3 years. I was hoping the reverse takeover would happen but it did not. The huge loss in P&L is because when it got bought over, it distributed its capital in the form of dividends last year. Overall, we made an absolute +39.9% from it and an annualized return of +12.4%. I was just blogging about Sing Holdings last month that it should trade nearer to its peers PB and it came faster than I expected! It was sold as the trailing stop loss I set got triggered. Fortunately, the price was near what I had in mind and there was a better opportunity (Singtel). 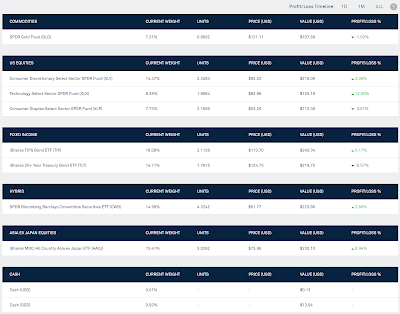 Overall, we made an absolute +18.4% and an annualized return of +514.6% for holding 34 days. lol. I have always wanted to sell Wee Hur because it is not my kind of stocks (not an asset play or a dividend stock). I bought it years back when I was blindly following people in the forum without analyzing the fundamentals myself (I did not know how to do it then). 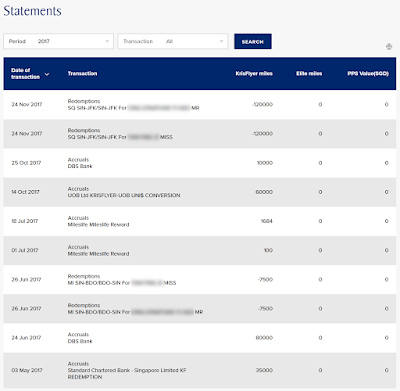 The opportunity came this month when the price shot up too and I sold it on the same day as Sing Holdings for Singtel. Overall, we made an absolute loss of -16% and an annualized loss of -5.8%. Croesus Retail Trust is another stock that got delisted this month as it was bought over at a premium to its NAV (similar to Saizen). Japan stocks are my lucky star. lol. Overall, we made an absolute +57.8% from it and an annualized return of +20.6% after holding for about 2.5 years. SmallCapAsia: Will Geo Continue to Deliver? As mentioned above, there was an opportunity to buy Singtel. 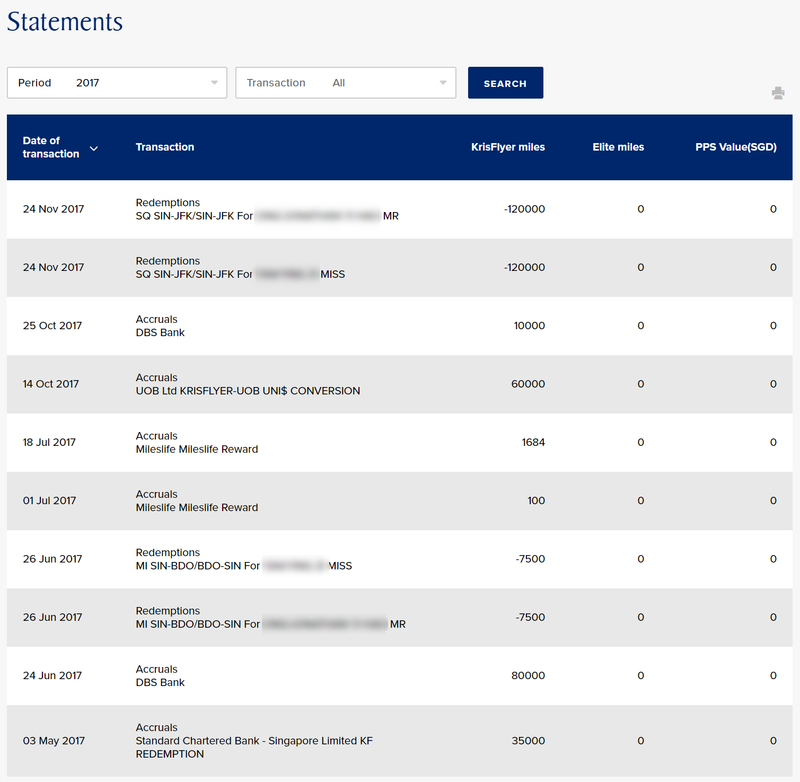 Given the limited capital and the timely stop loss of Sing Holdings, I went on to liquidate Wee Hur and top up another $200+. Why Singtel? The above information is extracted from SGX StockFacts sorted by market capitalization. This may come as a surprise to you but the market capitalization of Singtel is actually larger than our 3 banks! Too big to fail? Their business is so diversified that the 4th telco has limited impact. Furthermore, a 4+% dividend yield for a blue chip with the potential for capital growth is extremely attractive! Bought a new toy - Mi Smart Scale!